On the morning of your wedding day, you will spend several hours getting ready for your ceremony and reception. 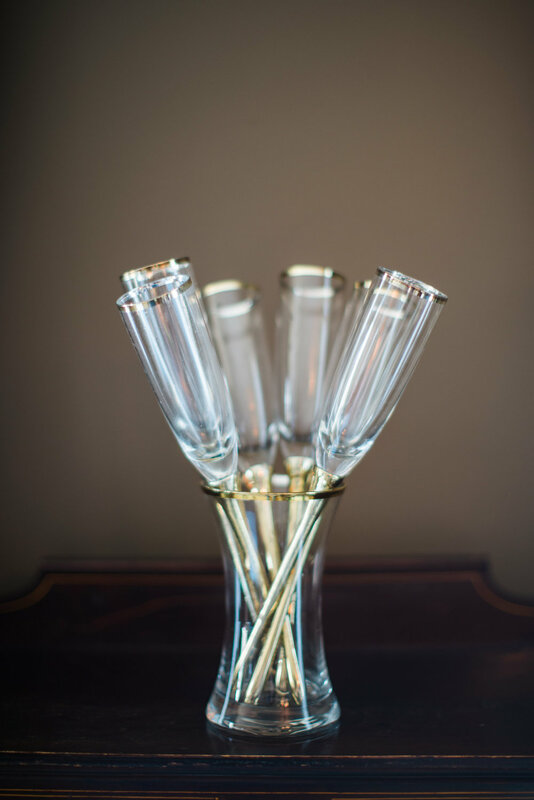 It is super important that you have a designated place to spend these hours preparing and relaxing with your bridal party. Added bonus: A plethora of windows and natural lighting will score big points with your hair and makeup artists as well as your photographer! 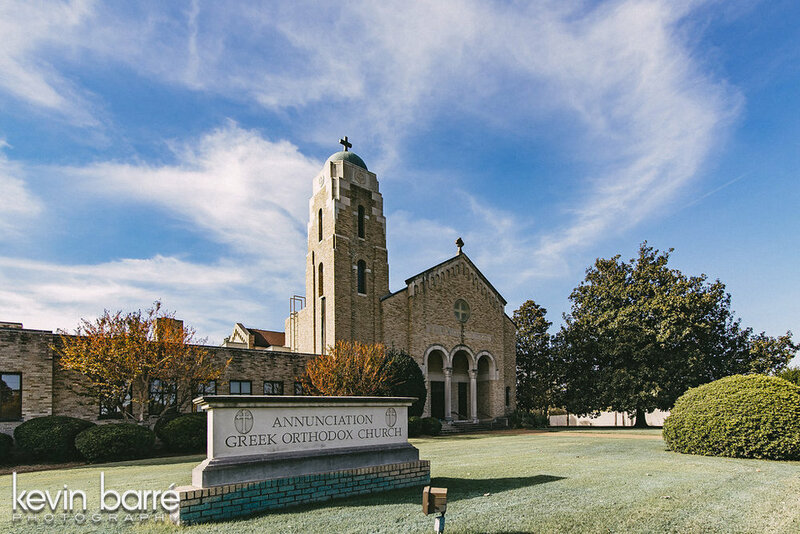 Here are four beautiful bridal suites around Memphis that our team and brides adore. Nestled beneath century-old magnolias, the Stratton House is located in the heart of the historic district. Built in 1859, the house is one of Collierville’s oldest and most historic homes. The home has three bedrooms + bridal room. The natural light and elegance of the home makes it a perfect place of comfort, beauty, and privacy for a bride to enjoy the morning of her wedding. "It’s a very beautiful and cozy place to be in and I wanted something relaxing for the morning of our big day to put me at ease. It was very close to our venue so there was no feeling rushed to leave and get any where on time. " It's true! We have had several brides rent an AirBnB as their bridal suite. It gives you the same privacy and luxury of your own home but typically with more rooms/space to accommodate your bridal party. Here’s a tip: pick a spot close to your ceremony location for short travel times between locations. Bethania Baray did just that and we are obsessed with the home she chose! Overlooking the Mississippi River, River Inn gives you all the old south charm with a modern and intimate feel. The hotel is in the center of Harbor Town, with just a short walk to the river front. Danielle chose the Admiral Penthouse Suite that suited all her needs prior to her ceremony, but the hotel offers several suites. River Inn was so pretty! We loved the views and all the space it provided. A bridal suite we have often found ourselves swooning over is 409’s. The huge windows, spacious seating, and 6ft mirror are just some of the highlights. The large makeup counter is a selling point for a lot of brides and we couldn’t blame them. The suite doubles as the main women’s restroom, but there is an additional private room if needed. The wedding day can be an emotional day, so it makes sense when a bride wants to be in the comfort of her home or the home of a family member. We can't blame her! 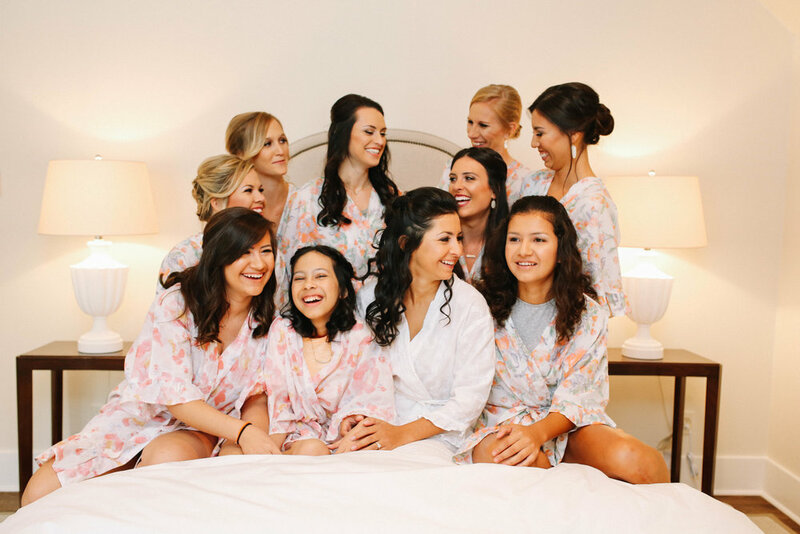 If you choose to get ready in the home, make sure there is comfortable room for the bridal party + family. Melanie enjoyed her morning at home and it couldn't have been more perfect. The natural lighting in her photographs is so dreamy! Read more about Melanie's big day here. Did we miss one that you think belongs on this list? Comment below! Picking your wedding photographer is one of the most important parts of your planning process. This vendor will be by your side the majority of your special day, so it is super important that you feel at ease with this person. In order to find someone that suites you as a couple follow these 5 steps! Pick the style of photographs that fit's you two as a couple. There are several different styles that you'll see when looking at wedding photos, most fall under one of these four categories. The photography style should be something you could imagine loving for many years to come as your look back on your wedding day. Research your photographer. Check out their website, instagram, and most importantly read their reviews! Sometimes pictures don't capture the full photography experience so make sure to read what other bride's have to say. Look for your venue in their photographs! This will help imagine the photos you will receive. Plus, if your photographer has worked at your venue they will already have some great shots in mind! Make a list of your top 3 photographers. Depending on the popularity of your date or how far out your wedding is, your first pick could already be booked. Have two other choices at hand so you can quickly contact them next. Contact your first pick! Email them with the date of you wedding + hours you will need them. Meet with them (or at least have a FaceTime call). Email can be impersonal and once again you'll be with this person(s) that majority of your wedding day so it is super important to get a feel for each other and start a relationship! Need some help getting started? Check out some of our favorite photographers as featured on our blog! As we love to describe them as the modern day Barbie and Ken, Taylor Wilson and Blake Tyler’s wedding was nothing short of beauty and excitement. They had envisioned their day to be relaxing with a grand side of fun for everyone. 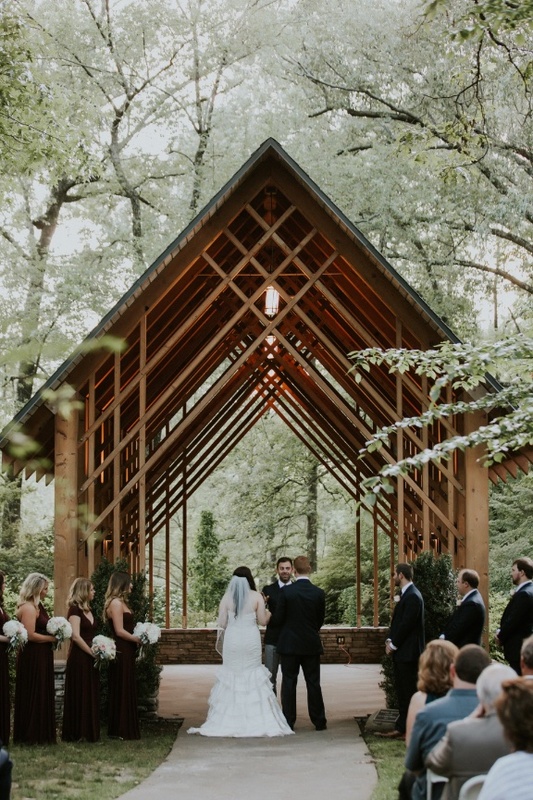 Even though the rain held off until after the ceremony, plans were made ahead to have a gorgeous tent set up to make sure the celebration still went on despite the crazy Memphis weather. What an an absolute pleasure it was to coordinate a special day for such a warm-hearted couple. It was also such an humbling experience to get to work alongside Taylor since she has worked with many other planners when working in the rental business with Mahaffey. We cannot say enough kind words about this beautiful couple – Congratulations Taylor and Blake! It is always so special to walk into a wedding and see a couple’s personality represented to a tee. Melanie and Colin’s wedding was such a classy and fun event that we wish we could do it all over again. The beautiful couple had one request for the night and that was for their guests to enjoy themselves and have a ball! It was nothing short of a good time with the amazing AZ IZZ Band from Atlanta. Their energy and dance moves kept the party hopping all night long. It is such a fun experience to work with a bride who also has such a talented, creative mind. Melanie worked with us very closely on the design and color palette of the whole event. She beautifully designed her own invitations and guest guide for the weekend. We could not be more excited for Melanie and Colin, and we wish all the happiness in the world for them! There is something special and unique added to a wedding when the couple decides on a venue that is a deeply historic site. 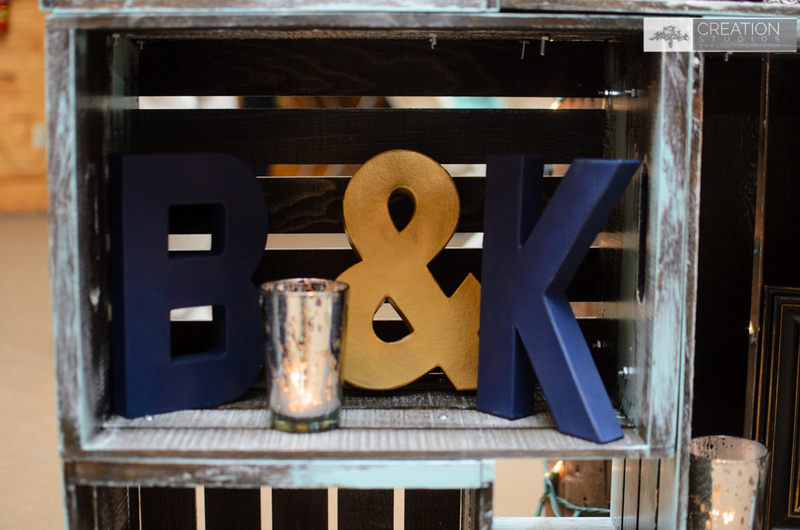 Kalin and Ben wanted a sweet ceremony that encompassed everything this venue had to offer. They knew the moment they saw the amazing oak tree on the grounds that this was the place they would become one. The old oak tree was used as the gorgeous backdrop. We incorporated ladders and lanterns into the ceremony to mix with the vibe of the venue. As the day started out, there was bad weather in the forecast leading up to the ceremony. The sun was covered by gloomy clouds, and it looked like a storm was brewing. An amazing moment for this couple and the wedding itself was when the officiant gathered Kalin, Ben, and their wedding party, and prayed that the weather would hold off for the wedding. 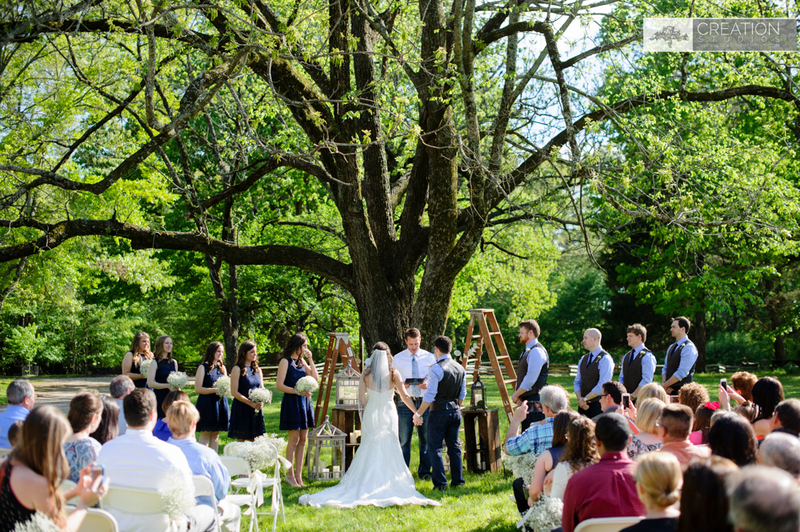 It was extraordinary to see at that very moment, the clouds parted and the sun shined its rays down right on the large oak tree where the vows would be exchanged. The sky was clear for the rest of the day! It was truly a spectacular sight. We kept the reception romantic and tied in with the aesthetic of the venue with floating candlelight and lanterns. 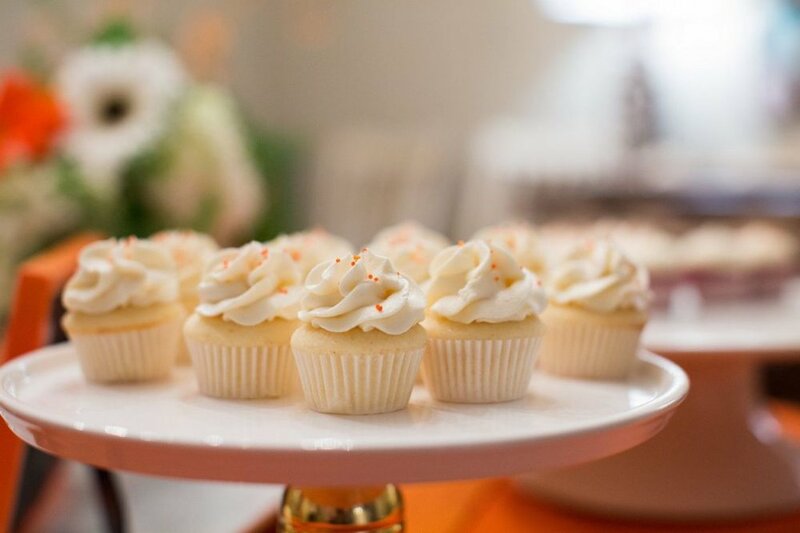 Kalin's father incorporated some gorgeous sentimental pieces by handmaking the cupcake tower and the wood crates that displayed all of the personal photographs and decor. The bride and groom opted for yummy cupcakes by The Flour Garden as their wedding sweets and a southern-style buffet by Draper Catering. The celebration continued into the night with lots of dancing and memory-making. It was such a sweet day for a very sweet couple, and we could not be more excited for them. Congrats Kalin and Ben! We love when the bride and groom decide to shake it up! 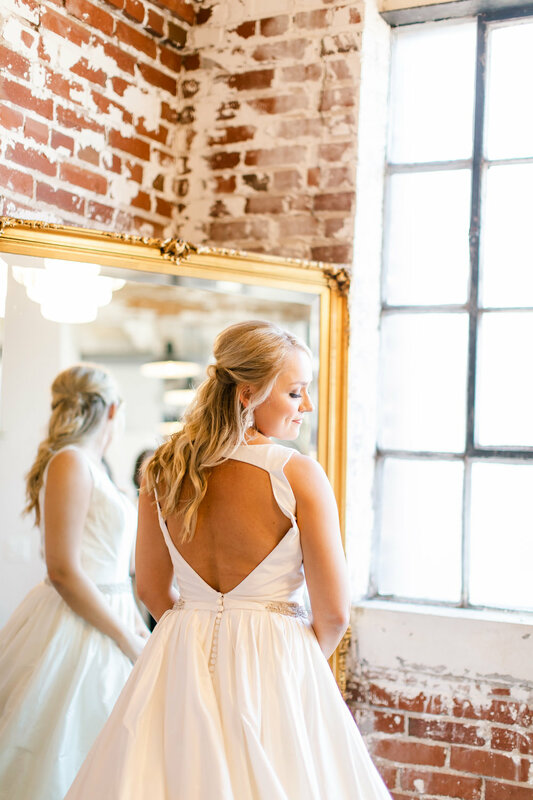 Olivia and Tommy eloped in Europe and came back home to Memphis for their reception. They wanted the aesthetic to be very “Memphis”. They chose a historic location in downtown Memphis for their reception- Earnestine and Hazel’s. This location is an old jukejoint that has been around since the ’30’s-starting out as a pharmacy. As guests entered, cold beer and yummy wine were offered to get the festivities started while the DJ spun records. Their priest came to the reception to give the couple a special blessing in front of their family and close friends. After the blessing, the groom gave a very sweet toast to all their guests thanking them for coming. The celebration continued with great food by Iris Etc. Catering who also provided a special cake for the bride and groom. The couple had custom bandannas with a map of Memphis made as favors for the party. 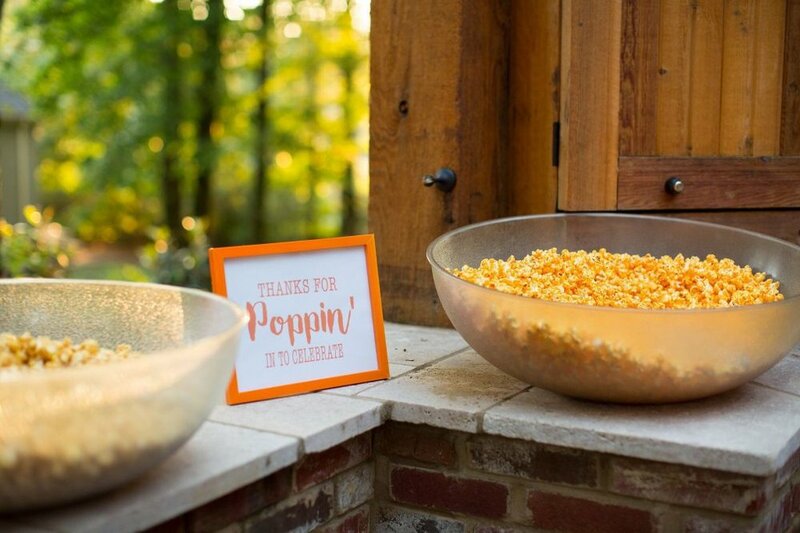 The Hardin House planned a fun, relaxed, and laid back event for the bride and groom so they could celebrate their recent nuptials with their family and closest friends. Congrats Olivia and Tommy, and Happy One Year Anniversary! There is nothing better than getting to extend the best day of your life. How can you do that may you ask? Just ask Morgan Faulk and Drew O’Brien. These two beautiful people decided on a destination wedding with an intimate ceremony on the beaches of Florida. But, the party was not over yet! Morgan and Drew threw a big bash of a reception back in Memphis with all their friends and family to celebrate. It was filled with lots of golds, pinks, and of course, sparkles. We wanted to make the night shine by making this custom “best day ever’ sparkly sign. We were so excited to hear that it was Morgan’s favorite decor item. It is such a fun day when we get to pull through our creative hats and make something incredibly special for the bride and groom. We wish all the happiness in the world to Morgan and Drew! Ryan and Catherine were so full of joy that working with them through the entire process seemed like a dream. They are completely easy going and so very kind that it was such a great experience to see those components flow into their wedding day. The ceremony and reception were held within the same location. The element of the church’s gorgeous stained glass window set the beauty of the night. 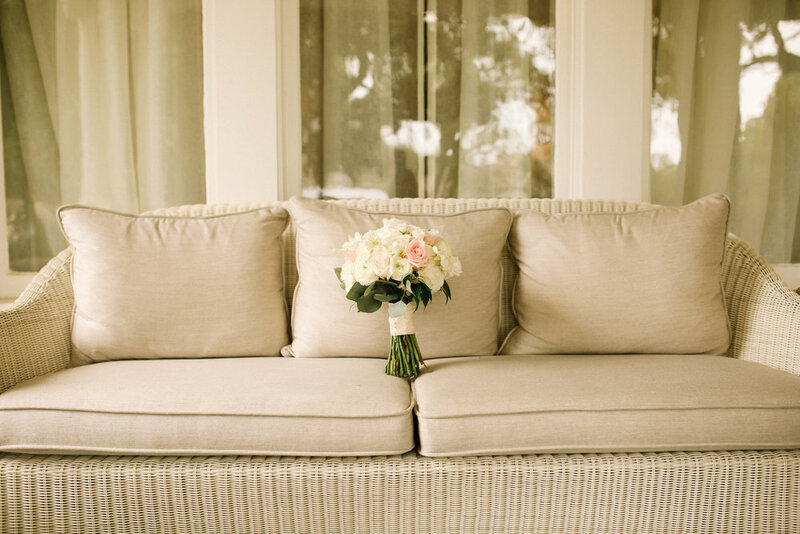 As guests walked into the reception room, they were encompassed by soft blooms. The whole evening flowed perfectly together. The one request Catherine and Ryan had was to make sure their guests had some fabulous food to eat. Iris Etc. provided a good down home Southern-inspired buffet that gave guests plenty of energy to continue to party on the dance floor. With Ryan a graduate from Mississippi State, hence the groom cake, and Catherine from Ole Miss, the night was filled with a multitude of friends and family dancing the night away! Congratulations Catherine and Ryan! Bethany and Basil’s wedding was full of Greek-inspired magic. 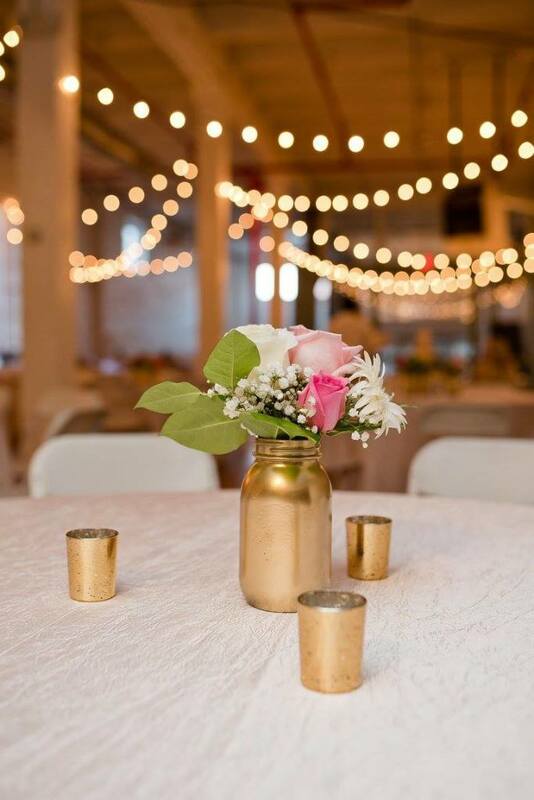 Their reception was located at Acre Restaurant, where the food is made in a timeless, yet modern style while combining their Southern roots with some of the world’s greatest cuisines. With hints of Italy, Asia, and American South in the dishes, Acre Restaurant was a perfect match to capture the Greek flair Bethany and Basil wanted in their food. The aesthetic of the day was filled with lots of golds, whites, and rich blues that made the reception glow all night. 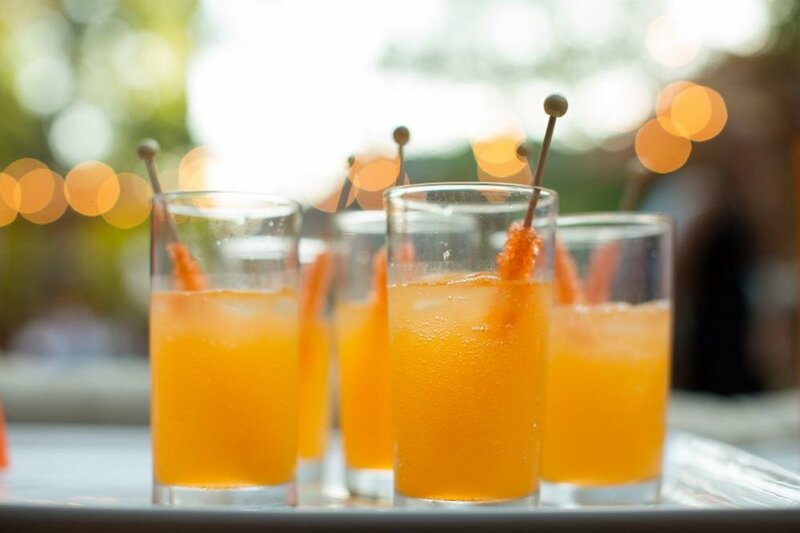 Bethany and Basil’s wedding made our creative juices flow as everything was custom-made. From the beautiful gold and blue linens to the matching DJ booth and bar front-from the embroidered pillows with a Greek key design to two large hand-painted entry columns at the front of the tent, everything was one of a kind. The chandeliers were draped with gorgeous fresh flowers, orchids, and hydrangeas to continue the grand theme of the night. To top it off, the round white dance floor gave the area its own uniqueness and fun twist. It was quite a magical night for such a beautiful couple. Congratulations, Bethany and Basil! 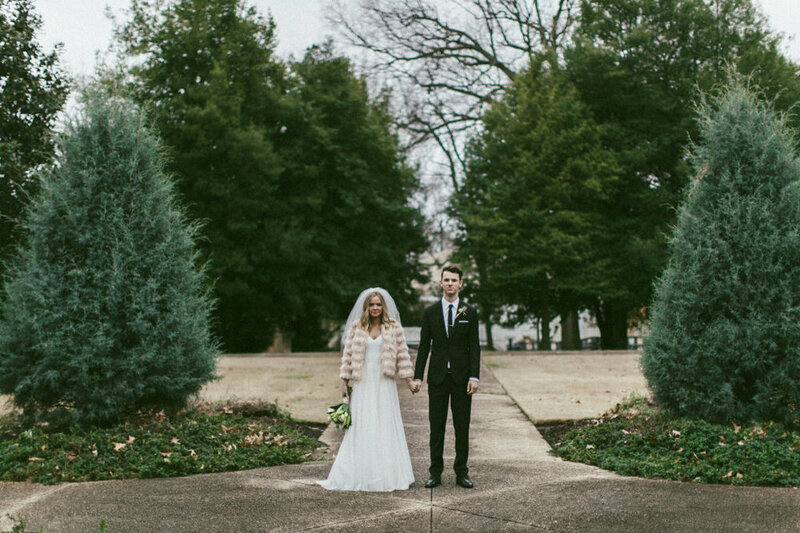 Natalie and Scott’s wedding was a sweet ceremony within Memphis’ beautiful Botanic Garden. 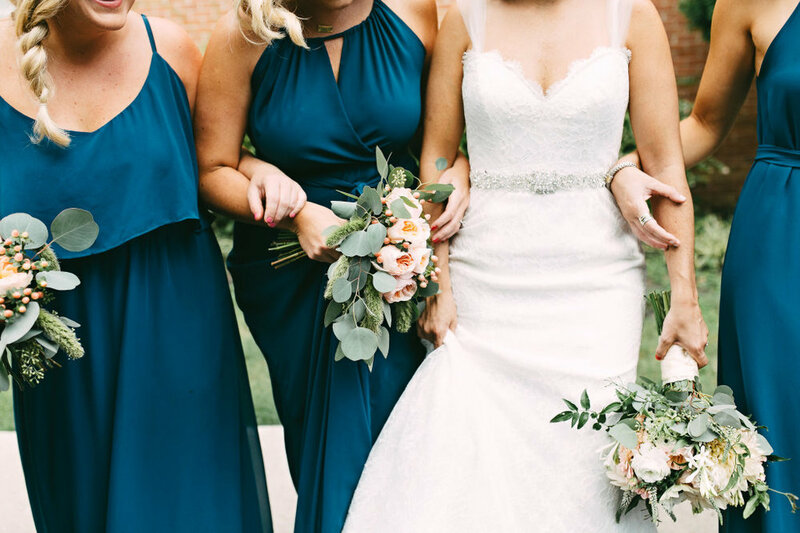 A string trio set the tone for that afternoon with romantic pieces as the bridal party and the bride herself walked down the aisle. After the ceremony, Natalie and Scott’s guests were welcomed to a champagne cocktail hour in the herb garden before the reception. The gorgeous reception was held at Sara’s Place at the rear of the Botanic Gardens. The room was lined with big, beautiful windows that allowed a great amount of natural light to seep in. With the color palette of dark burgundys and shimmering golds, the reception was glowing brilliantly. The couple played on the venue of their wedding by having the guests placed at their tables by a “seeding” chart. 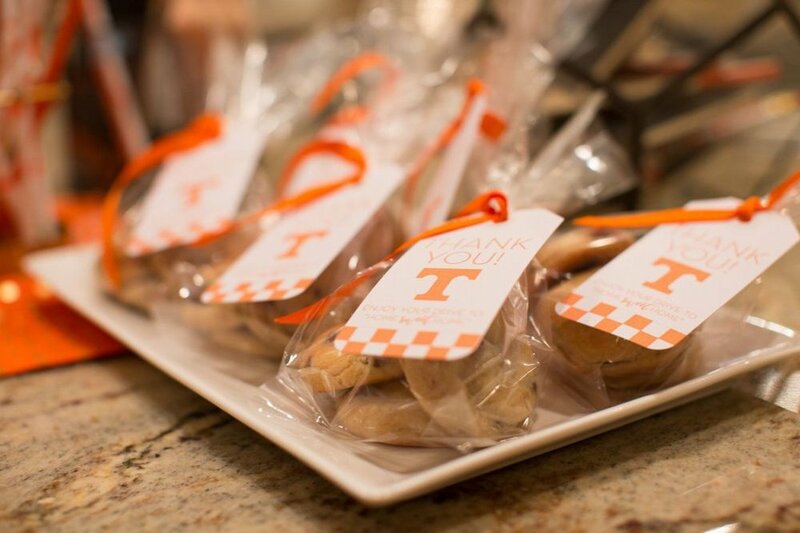 After, Simply Delicious Caterings served guests a southern-inspired menu. By the end of the night, the room was filled with great music and lots of dancing. Natalie and Scott’s day really reflected the kind yet fun personalities they each have. We wish them a lifetime of happiness! Graduating from high school is always a milestone celebration. 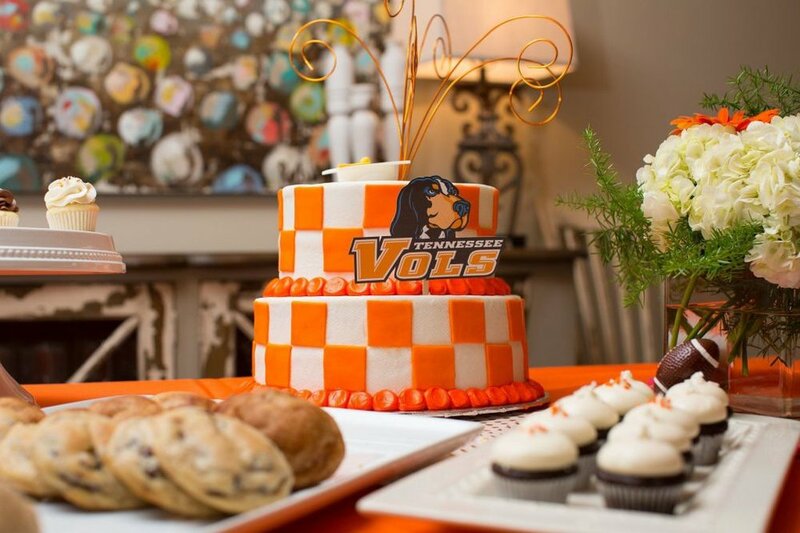 We were so honored to be able to design and plan this fun and spirited Rocky Top-style graduation party for Lauren! Every corner a guest turned, we wanted a splash of the Volunteer Orange to pop. The beautiful flower arrangements by Southern Bloom allowed for a fresh yet festive twist along with the gorgeous checkered cake by Kipp Cakes. We incorporated a fun way to display the ‘Smokey Bar-b-que Buffet’ and ‘Shake It Up’ milkshake bar to bring the theme fully back around. The feel of the night encompassed so much love and celebration for sweet Lauren, and we wish her all the best in this next chapter of her life!